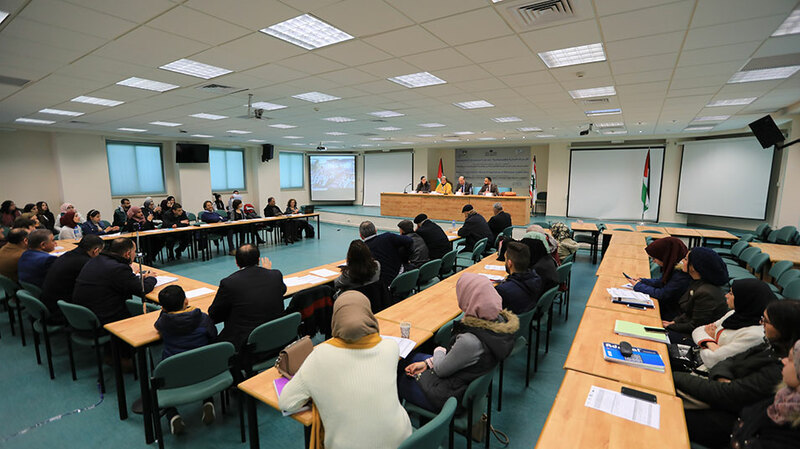 Professors and experts from Birzeit University, the Islamic University of Gaza, and Al-Quds Open University held a conference titled “International Conference for Business and Economics Research Experiences (ICBE)” at Birzeit University and the Islamic University of Gaza, on Monday, March 4, 2019. This conference was the closing symposium of the project “Developing the Capacity of Business and Economic Research Centers at Palestinian Higher Education Institutions (BERC),” funded by the European Union through the Erasmus Plus program. Comprising Al-Azhar University, Birzeit University, the University College of Applied Sciences, Al-Quds Open University, the University of Huddersfield, the University of Almería, the University of L’Aquila, and the Royal Institute of Technology, the project aimed to develop and reinforce the quality standards for business and economics research centers at Palestinian institutions of higher education and to build the capacity of their research staff. “Research is a vital tool in the study and analysis of business and economic phenomena in Palestine. 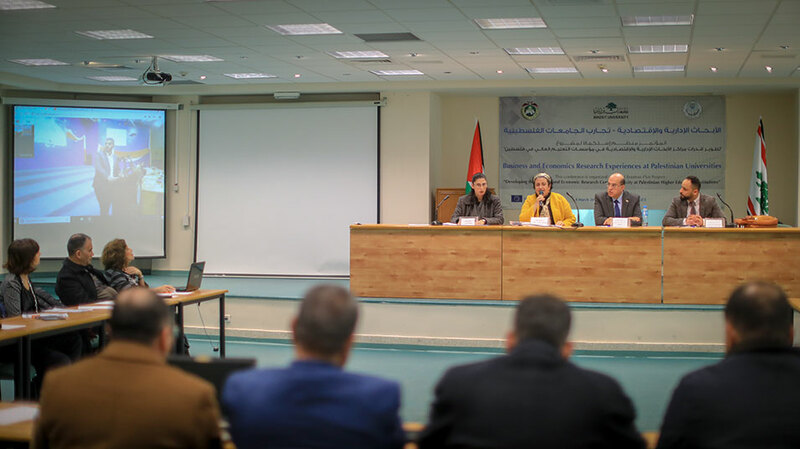 It plays an essential role in the generation of data and allows Palestinian universities and colleges to produce knowledge that takes Palestinian and Arab contexts into account,” Al-Botmeh said. Nasser Farhat, president of the Islamic University of Gaza, highlighted the importance of cooperation in research, emphasizing that Palestinian universities must collaboratively engage in research that positively affects Palestinians. He highlighted the limitations and obstacles faced by researchers and called on universities to help remove these challenges and enable experts from all over Palestine to produce joint applied research. Mohammed Miqdad, dean of the Faculty of Commerce at the Islamic University of Gaza, confirmed that the BERC project helped develop and improve research mechanisms at Palestinian universities. He called for the development of a national research strategy to guide researchers in carrying out studies and analyses that help develop the Palestinian nation. Sadiq Abu Sulaiman, vice president for academic affairs at Al-Azhar University, emphasized the unique, interconnected nature of individuals, institutions, and nations in the twenty-first century, adding that Palestinian universities must take advantage of the available tools and resources to encourage and promote a national culture of research. 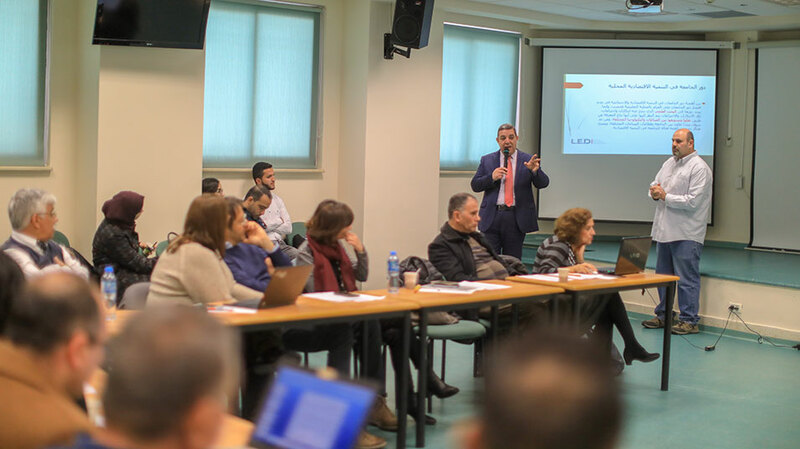 Nedal Jayousi, director of the National Erasmus+ Office, gave a brief overview of Erasmus-Plus-supported projects in Palestine and noted that the BERC project was unique in its focus on the tools and mechanisms that help produce new knowledge and encourage research. Jayousi stressed the need for more joint projects in economics and business education and research. Maher Ajour, vice president for academic affairs at the University of Applied Sciences, stressed that Palestinian universities must cooperate and produce knowledge that is competitive on regional and international levels and benefits the Palestinian community as a whole. Subsequently, the conference comprised two sessions. The first, chaired by Nojoud Habash, professor of business administration at Birzeit University, focused on the management and sustainability of research centers and on partnership management in international projects. In this session, four research papers were presented: “Experiences in Establishing and Managing Research Centers” by Birzeit University professors Suhail Sultan, Nojoud Habash, and Omar Omran; “Palestinian Business and Economics Research Centers: Financial and Intellectual Sustainability Challenges” by Al-Quds Open University professor Raslan Mohammad; “Managing Partnerships in Think Tanks and International Academic Projects” by Birzeit University professors Anton Sabella, Samir Baidoun, Mira El-Far, and Wojdan Farraj; and “The Higher Council for Innovation and Excellence: Is it the Correct Model?” by Al-Quds Open University professors Wisam Samarah and Mohammad Talalweh. The second session, chaired by Atteyeh Musleh, professor of business administration at Al-Quds Open University, focused on the quality of input, output and instruction of research curricula. This session featured the papers “Assessing the Quality of Research Courses Instruction and Management” by Birzeit University professors Yousef Hassan and Nojoud Habash, “The Role of University Research Centers’ Objectives in Assuring their Sustainability” by Al-Quds Open University professor Salah Sabri, and “Assessing the Quality of Research Inputs and Outputs” by Birzeit University professors Mohanad Ismael and Tareq Sadeq. In their closing remarks, participants called on university administrations to foster research as an effective method to aid in solving social and economic issues; they stressed that the government must encourage research through financial and other means, emphasized the positive effects of creating an atmosphere of innovation in schools and at universities, highlighted the role of cluster research groups − comprising representatives of educational, civil society and governmental institutions − in solving social and economic issues through the production of applicable research and studies, and called for increased attention to and research into the role of decision-making when issues are resolved on the ground.